In the battle to win hearts and minds to the cause of life, it is sometimes necessary to speak in non-religious terms. This is certainly possible and effective. For example, medical science and biology can help us defend the lives of unborn children and argue persuasively for an end to abortion. a unique human life with DNA that is distinct from each parent. Even if an opponent argues that this life in the womb is not yet a person, one need not resort to religion to oppose this claim. After all, a lack of certainty about personhood should not lead to a callous sentence of death, but rather to the urgent preservation of the life. We have too sordid a history of the powerful declaring the innocent weak as something less than human. At other times, what is needed is precisely the proclamation of the Gospel and trust in the Holy Spirit to convert heart and minds. “The root reason for human dignity lies in man’s call to communion with God. From the very circumstance of his origin man is already invited to converse with God. For man would not exist were he not created by God’s love and constantly preserved by it; and he cannot live fully according to truth unless he freely acknowledges that love and devotes himself to His Creator” (GS 19.1 ). The simple truth spoken of here is that our dignity as human persons derives not from the color of our skin, the nation of our origin, the level of education we have attained, the amount of wealth we have accumulated, the degree of our independence from reliance on others, the economic job we perform, our friends, our family, or any of our talents. Our dignity does not depend upon our health nor our age. 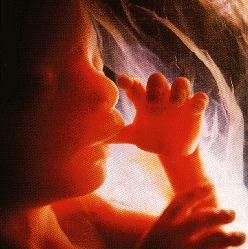 Our dignity from the moment of conception comes from the God who created us and NO ONE can take this away from us. This call places an obligation on us. We must respond to this call. We can either accept the loving call of God to communion, or we can reject it. We can either respect the call of God to others, or we can ignore it. The first choice in each of these leads to life, the second to our destruction and spiritual death. The first leads to joy and fulfillment, the second leads to misery and despair. At the heart of the Church’s insistence on respect for human life and the right to life of the human person is the dignity of the human person. Abortion, euthanasia and other direct attacks on the right to life ignore this simple truth. “The inviolability of the person which is a reflection of the absolute inviolability of God, fínds its primary and fundamental expression in the inviolability of human life. Above all, the common outcry, which is justly made on behalf of human rights – for example, the right to health, to home, to work, to family, to culture – is false and illusory if the right to life, the most basic and fundamental right and the condition for all other personal rights, is not defended with maximum determination” (Blessed John Paul II, Christifideles Laici, no. 38). We must not be afraid to speak of this relationship between God and Man. We must not hesitate to proclaim the Good News of Jesus Christ. And oftentimes, it is this proclamation of the Gospel that must precede our efforts to explain why we Catholics are prolife. Have you had the opportunity to share the Gospel with someone who does not respect the right to life of all innocent humans from natural conception to natural death? What were the circumstances? Were you successful… did you make any headway? Deacon Mike Bickerstaff is the Editor in chief and co-founder of the The Integrated Catholic Life™. A Catholic Deacon of the Roman Rite for the Archdiocese of Atlanta, Deacon Mike is assigned to St. Peter Chanel Catholic Church where he is the Director of Adult Education and Evangelization. He is a co-founder of the successful annual Atlanta Catholic Business Conference; the Chaplain of the Atlanta Chapter of the Woodstock Theological Center’s Business Conference; and Chaplains to the St. Peter Chanel Business Association and co-founder of the Marriages Are Covenants Ministry, both of which serve as models for similar parish-based ministries.